I would like to apologize for how long the video is. 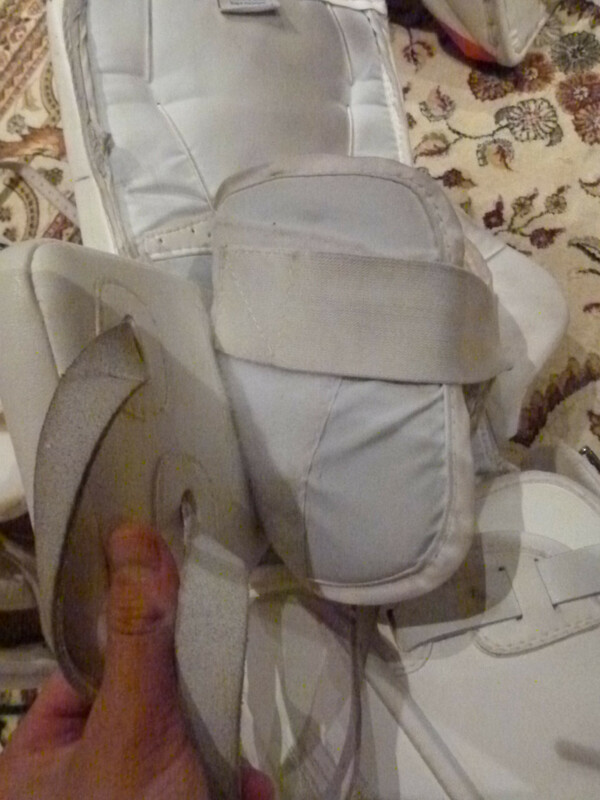 I wanted to get into all of the details in it and I wanted to show off the pads I compare it to (since those are in my regular rotation) as I mention them a lot in the written review as well. Pad History: Battram Fury Retro, Bauer Scott Munroe Pro Return X60/One95, Bauer Scott Wedgewood Pro Return X60 skinned as RX10s. 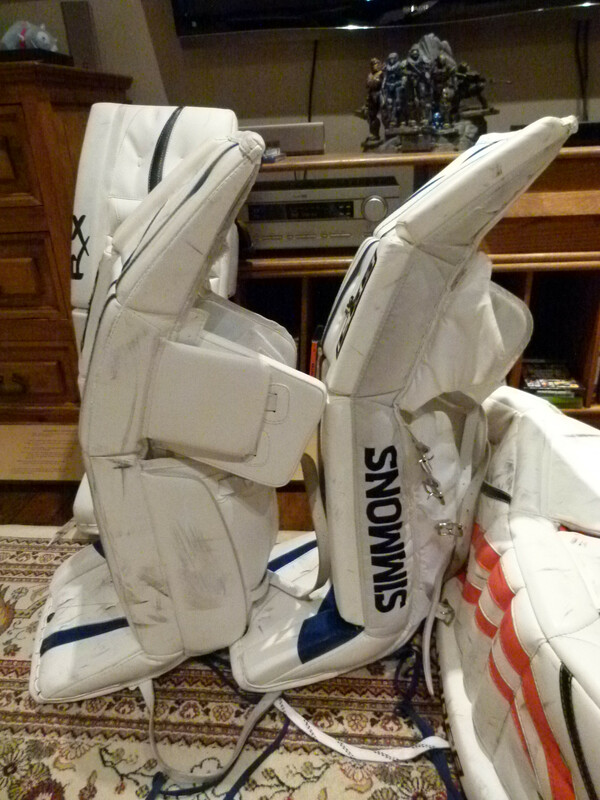 These pads aren’t the newest model offering for the Simmons 99x Series pads, they are very similar to the newest 998 series. My understanding is that the 998’s just have knee rolls and the 997’s do not. 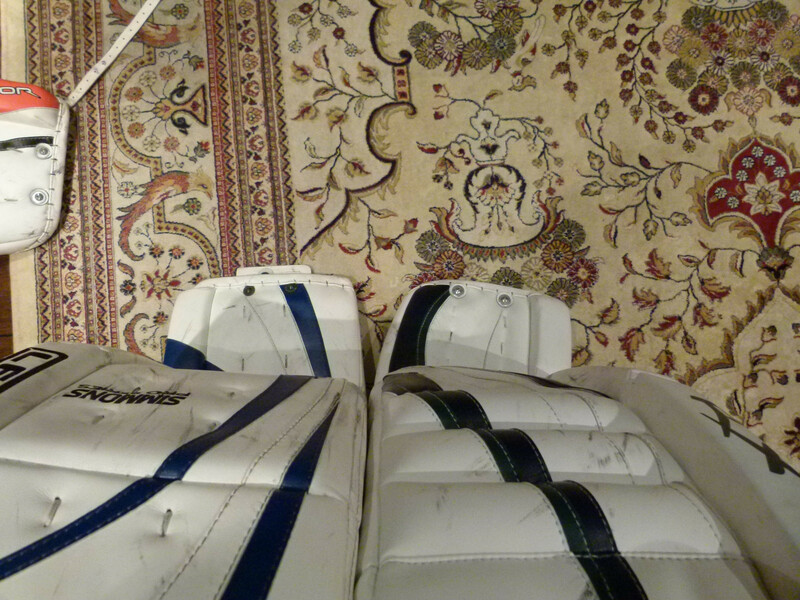 Initial Thoughts: When I grabbed these pads the first thing I noticed was how light and soft they were. When I pick up my Bauer pads they feel almost like a solid piece while when I pick up the Simmons you can feel the pad flexing. I had a feeling these were going to be very mobile pads from the get go. I knew when I got these that I am more comfortable and prefer a stiffer style of pad but I have heard good things about the 99x series and wanted to try them for myself. 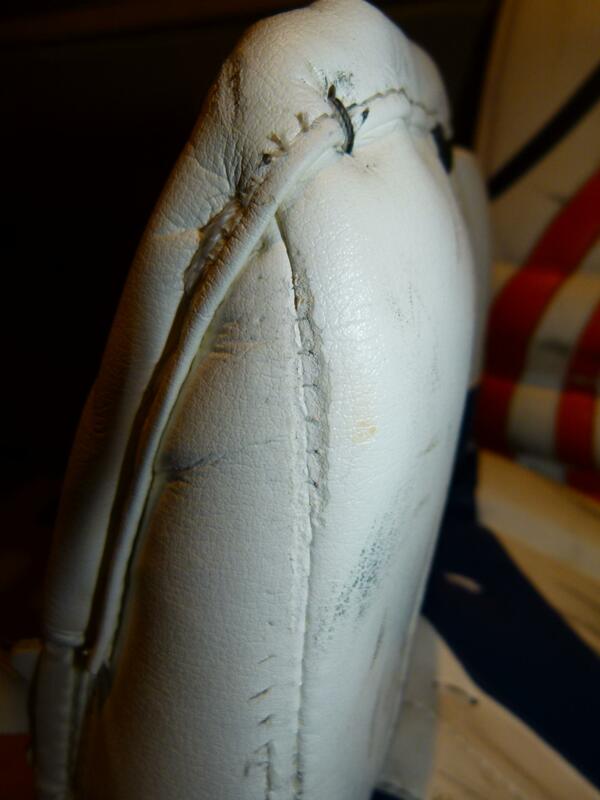 Durability: All pads wear over time and 99% of the pads have specific wear bars to prevent wear happening to the structure of the pads. These bars are fairly easy to replace and appear around the toe area of the pad where the most contact with ice happens. 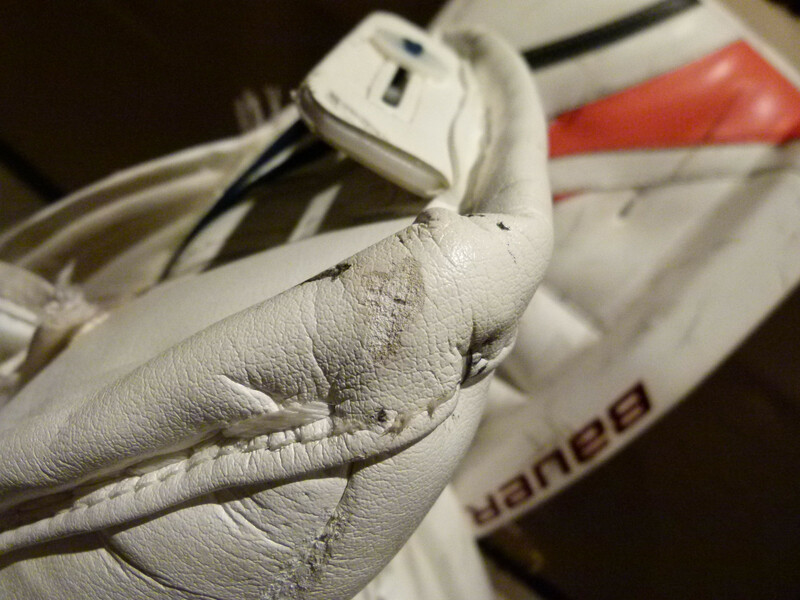 I won’t be commenting on that type of wear on these pads as that is impossible to stop. 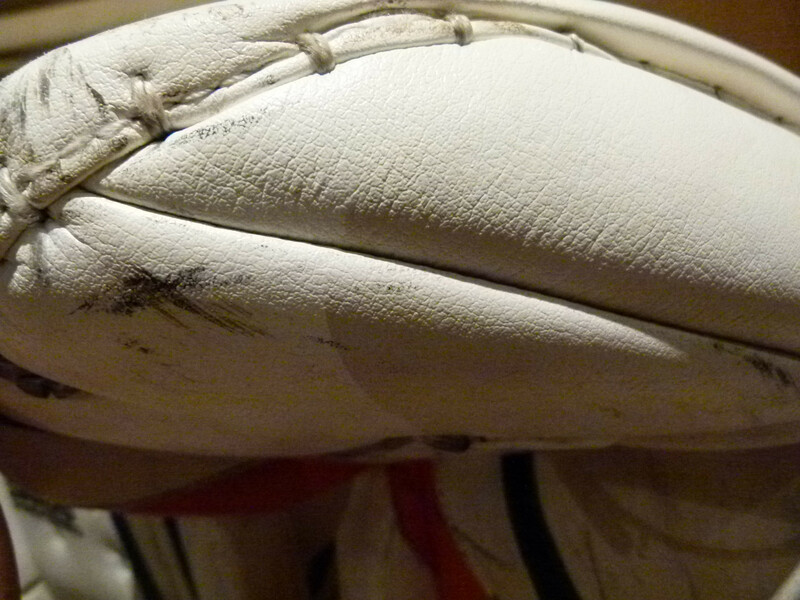 The 997s have held up fantastically on the knee block and the basic nylon backing of the pad did wonders to stop the tongue of your skates wearing out the leg channel area. While other pads feel more “luxurious” with nash or digital material along the leg channel the nylon on the 997 show significantly less wear for little to no performance or comfort loss. The inside landing gear of all 3 pads. Simmons has the flattest/most solid sliding area and the skinniest calf landing area. This never caused issues with pucks slipping through and I found I “caught” more pucks under the pad than I did with the others. 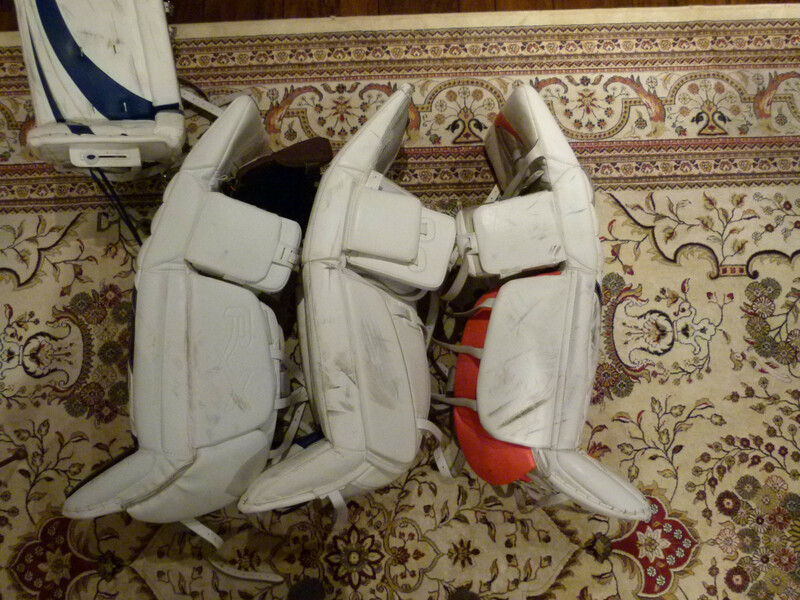 Inside and outside gussets, pads holds a nice S-shape. Outer gusset is very thing and I’d prefer leather instead of nylon (or use a coloured nylon) but again I didn’t bye these custom. 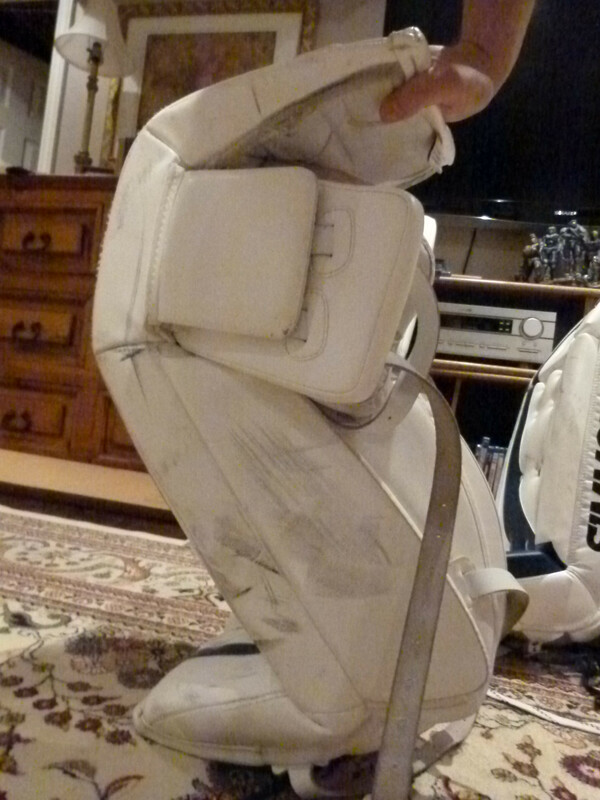 Shows how flexible this pad really is. Very easy to bend this much and it conforms to the movements of your leg really well. The landing gear never got in the way of the calf wrap when I wore them. 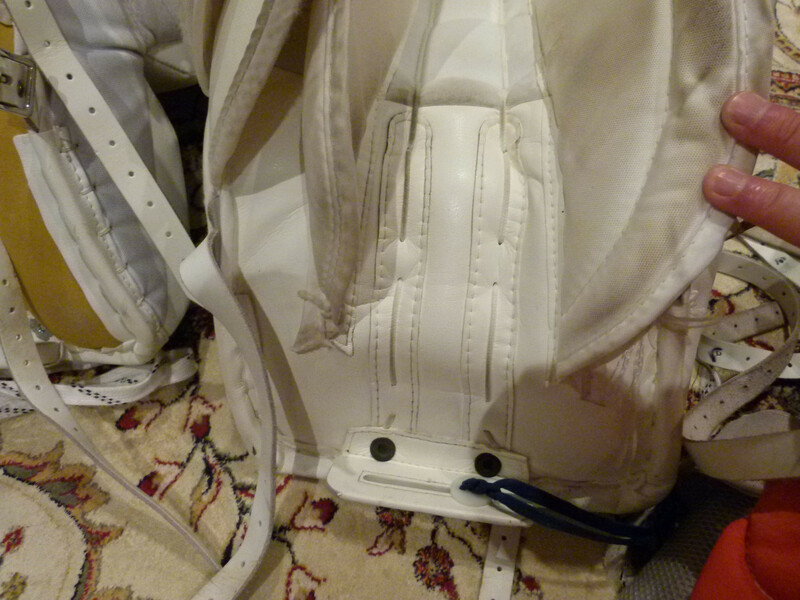 Large velcro on the knee cradle allows for adjustability of the knee block. I wish more pads had this as you can adjust the knee block up and down depending on where your knee lands when doing down in the butterfly. Shows off the square toe of the Simmons compared to my preferred tapered toe on my Wedgewood Bauers. The boot on the Wedgewood Bauers (left) is noticeably thicker and on a more steep angle. I find pucks off the boot go into the corners with the Bauers and pucks off the Simmons go back out in front. While the Simmons 997 is the simplest in terms of construction, it is the best for durability. I Munroe X60s (middle picture) are the best for the smoothest boot but Simmons has the best leg channel. Simmons 997 boot has extra jenpro strips, overall this is the best back end of the 3 pads for durability. Shows the deepness of the boots, the Simmons is the most table top boot of the 3, basically just sits ontop of your skate without a real channel for the skate to sit in. Toe binding wear is good for 6 months of use. Nothing to worry about at all. This wear on the toe I am not thrilled about and am slightly worried, the stitching here has completely come apart. The broken stitching as mentioned above. 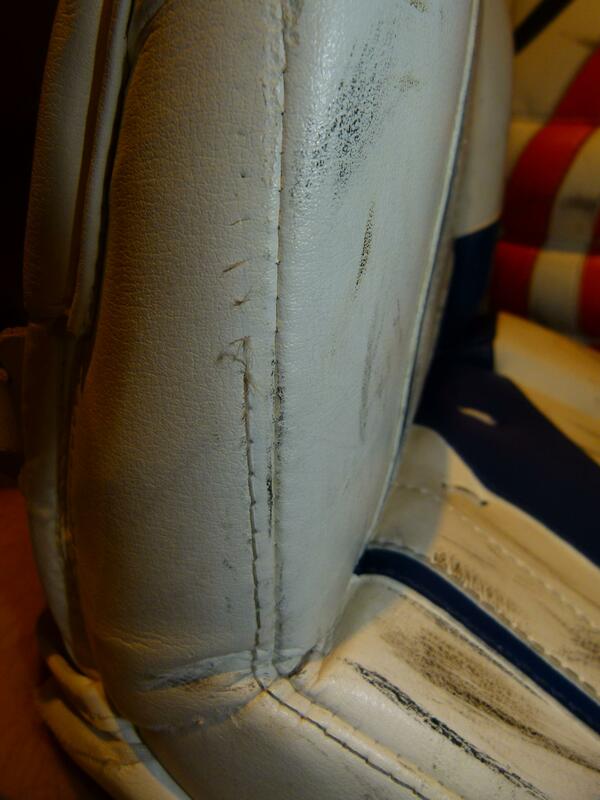 Compared to how the Bauer boots are where no stitching or seams are visible where the toe hits the ice.